We published a link to the following article on our Facebook page, and it’s worth sharing here, too. Biking with kids is all the rage in Portland these days, but biking with six kids between the ages of 2 and 11? That’s something I never would have thought possible before I met southeast Portland resident Emily Finch. Finch, 34, is a powerhouse. 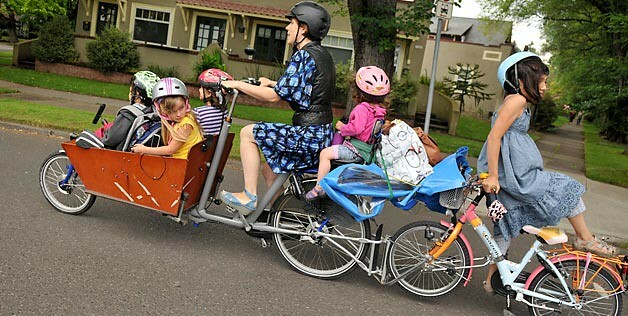 Watching her pedal her bakfiets cargo bike with four kids in the front, another one in a child seat behind her, and another one on a bike attached to hers via the rear rack, is a sight that not only inspires — it forces you to re-think what’s possible. Read the rest of the article and see more pics over at Bikeportland.org. As the article mentions, and as we’ve talked about repeatedly here — if you have the will and the desire to incorporate two wheels into your life, it CAN be done! I’ve met too many people “on the fence” about bike commuting…many of whom get hung up in logistical concerns or questions about what to do with their kids/clothes/appearance/safety/etc. While not everyone can forgo a car and switch to a bike (we understand that and accept that, believe it or not), there are still a LOT of people out there who could do it if they only put their minds to it. That is pretty amazing. As a Dad who carts just one of his kids around by bike every day, I can’t even imagine 6. The rig alone must weigh close to 100 lbs. That woman must have steel bands for legs! Graham…yeah, a bakfiets is a pretty heavy rig on its own (60-75lb). Add on the trail-a-bike, kid carriers, and all those young bodies and you’re probably looking at close to 500 lb. TRULY awe-inspiring!!! Stop breeding more copies of yourself. What a TERRIBLE mother! At least two of her kids have their helmets on incorrectly! And has anyone talked to this selfish and completely irresponsible woman about carbon footprints?? What a bad mom! It will be miracle if her children survive to be adults!